Need to drill a hole and leave no evidence behind? Check out this cool and weird product that will capture the dust into a bubble that you can then throw into the trash. A vacuum is probably more practical for a lot of drilling, but if you have a few holes, this bubble might save you. When you go to work you need a manly lunch. The Load-N-Lock Lunch Bucket is big enough to hold your manly lunch because it is made out of a bucket. The inside in lined with insulation to keep your food cold all day long and it even has a lockable lid. Not all of us have a surface planer, and if you do, it might not be big enough for all of you projects. One way to flatten these large board is to use a router and a homemade flattening jig. The Wood Whisperer shows us how he flattened his workbench after his workbench guild build. This jig can also be used to flatten any board. Matthias Wandel impresses again. In one of his latest videos he shows us the right way to make zero clearance table saw inserts. 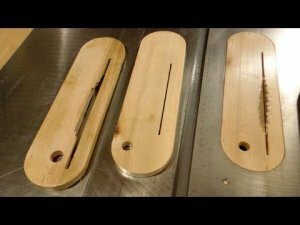 Instead of using your original table saw insert as a template, he explains why is his way is more accurate.